HYDAC series connection systems of the type series L and ML are controls made up of individual modules for oil-hydraulic plants in parallel switching. The design of these systems is preferably for the control of small-volume consumers and for pressure-/force-holding tasks. 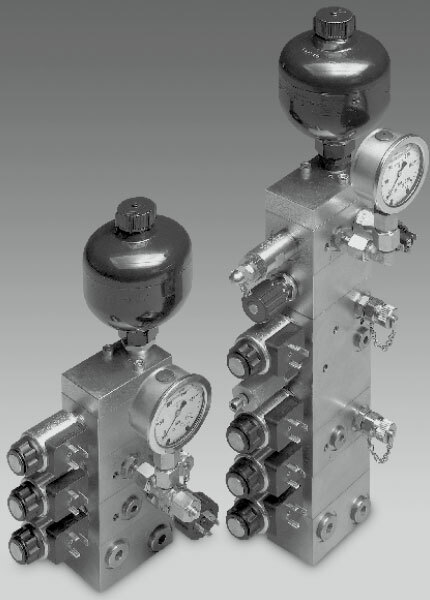 What’s more, it is possible to combine function modules with directional poppet valves, pressure and shut-off valves and pressure switches. The combination is on a base module in any order in accordance with the sequence of the control tasks. The representation of the end is an end module with or without additional functions. Different basic modules enable the attachment to HYDAC Compact units. Or also, with the aid of a pipe connection module, to any given hydraulic system. Thanks to its modular construction, this system enables the following: high flexibility through variable module alignment, individual solution of the control problems, small dimensions and great performance density, leakage security and inexpensive control through modular fabrication in large-scale production.